It is truly amazing, the amount of intriguing stories to be told of Fota Wildlife Park’s animals. Each individual really does have a unique past and an even more unique personality to match. 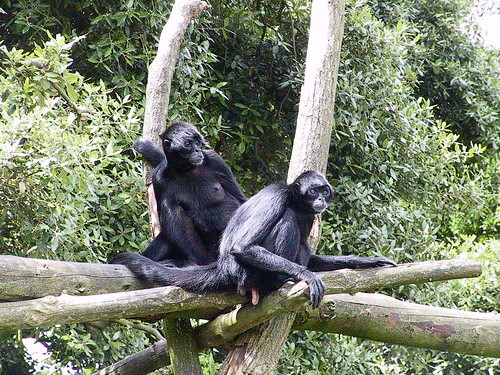 Our oldest spider monkey ‘Ol’ Blue Eyes’ is however somewhat special amongst Fota’s animals. This is due to the place in which her story began-The Wild! Unlike all the other animals in the park which were born in captivity, she was born in the tropical rainforest of South America! Although she came to us in 1993 from Chester Zoo, she was in fact wild-caught!! Nowadays, capturing wild animals for Zoos and Wildlife Parks is absolutely not allowed. It really is mind-blowing to think that as little as 39 years ago, in Ol’ Blue Eyes’ day, it was deemed acceptable. Back then, expeditions would have been sent out into the wild to capture animals and plants for captive collections. In those days, many animals would have died during capture and transport but the interest laid in attracting the paying public through the gates to look at the new weird and wonderful ‘specimens’. Thank God those days are gone. So what is the role of the modern Zoo/Wildlife Park today? Their primary aim is conservation. This is achieved through education, research, breeding and reintroductions. Today, the majority of Zoos and Wildlife parks allow free exchange of animals for breeding purposes, insuring the genetic diversity of the captive population. In fact, past practices seem to have flipped with many Zoos and Wildlife parks now sending animals to be set free in the wild as part of vital reintroduction programmes. Fota Wildlife Park has itself been part of the reintroduction of the European Bison in Poland and the Scimitar Horned Oryx in Tunisia, both projects helping to save species from the brink of extinction. With current extinction rates above those that occurred during the last mass extinction of the dinosaurs, maintaining healthy, genetically diverse ‘reserve’ populations is an invaluable safety net for conservation. 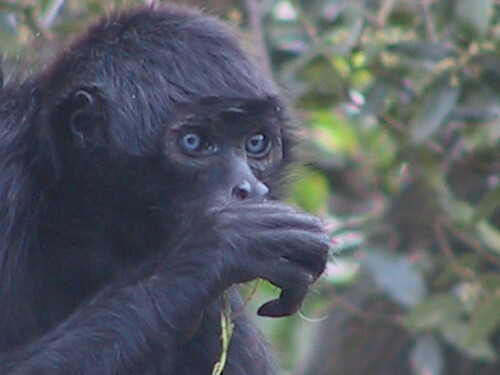 If the estimation about Ol’ Blue Eyes’ age is true, she is for her species, exceptionally old- the Colombian spider monkey’s lifespan is only to the early 30s! She indeed stands apart in the group with her striking blue eyes- all the others have brown eyes. Her behavior is also markedly different, showing wild characteristics and vocalizations that stand her apart from the rest of the group. It does seem at times that she stares at you with more intensity and a different expression than the others, and her stares can often stop you in your tracks as you're passing their enclosure. 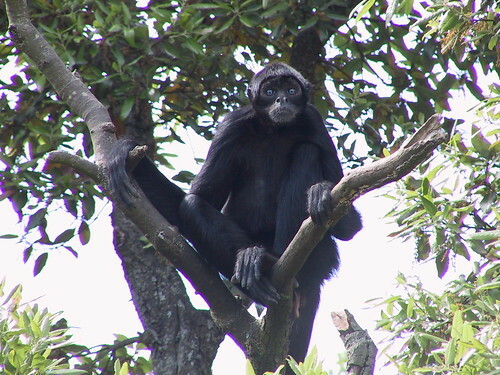 Spider monkeys are rather exceptional amongst New World monkeys being second only to gibbons in their agility up in the tree tops and a brain twice the size of a Howler monkey of equivalent body size. Their long spindly limbs and incredibly prehensile tail- which gave them their name- allow for such awesome acrobatics in the canopy. Their large brain is thought to be the result of their complex social structure entitled ‘fission-fusion’ which only occurs in one other primate, the chimpanzee, and their frugivorous diet which requires them to remember the locations of ripe fruit in the forest. Fota Wildlife Park’s group consists of another adult female (28 years), two adult males (24 and 7 years) and a very cute 1 year old female infant. The female’s enlarged labia makes it quite easy to differentiate between the sexes.